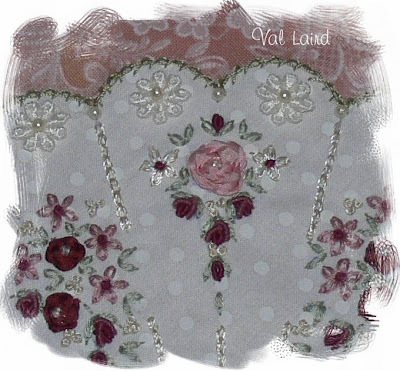 Then I fell in love with applique, particularly fusible web applique, so heaps of my designs feature both applique and embroidery. 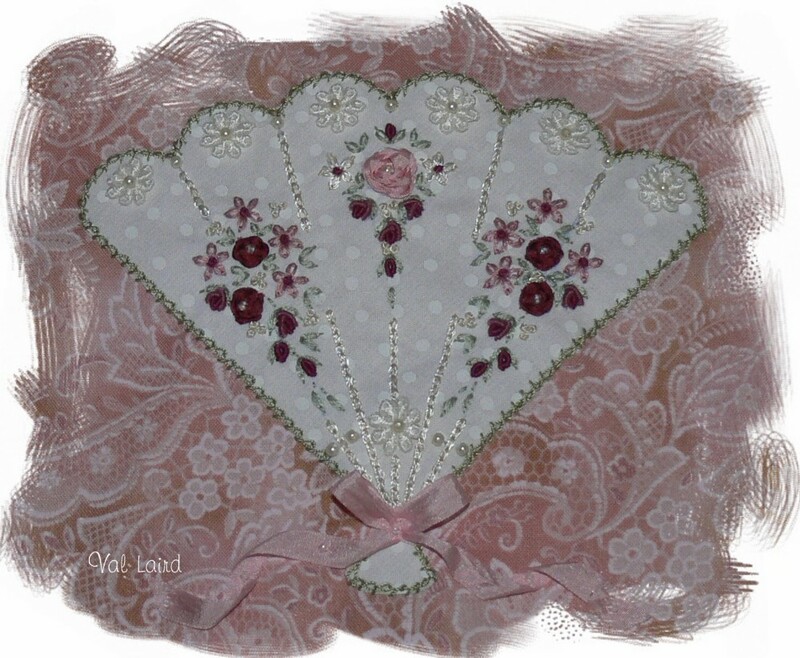 However, sometimes the call of embroidery is just too strong and I have to drop everything and do some serious stitching with beautiful silk ribbons, fancy cotton, silk and rayon threads, elegant guipure and plenty of pretty beads. 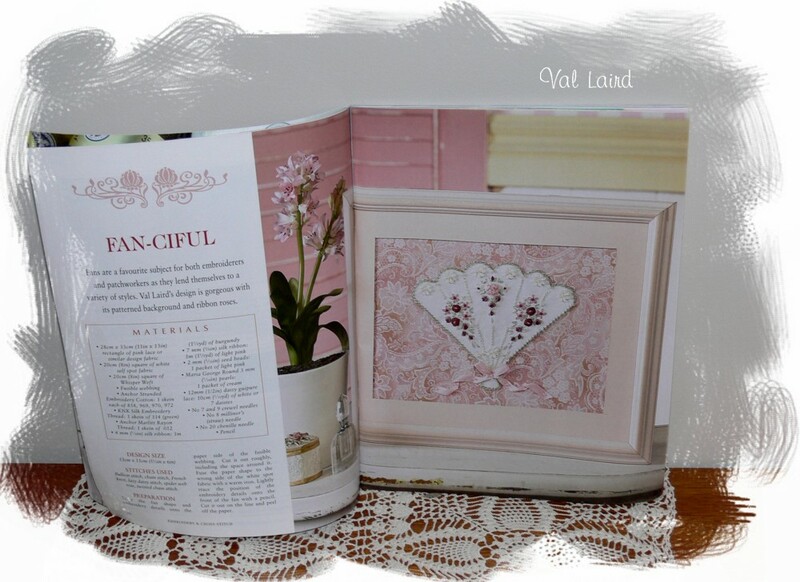 That's how "Fan-ciful" was born and featured in Embroidery and Cross Stitch magazine Vol 19 No 12. 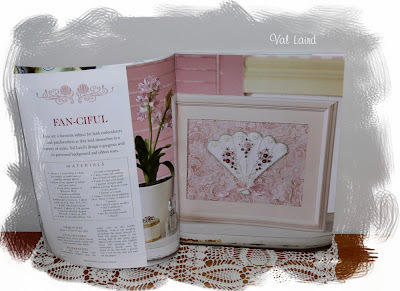 You can see I didn't drop my love of applique but instead worked out a way to showcase it! 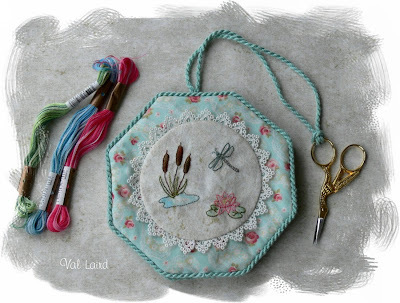 The lovely editor phoned me to see if I had any more embroidery projects I could give her! I didn't need a second asking! I like to do hand stitching at night and drawing, cutting and machining during the day. Serious embroidery takes a L-O-N-G time to complete so I've had plenty to keep me occupied in front of the TV lately! Congratulations Val,that`s a great news and fantastic milestone and more to come!! I am still working on my COnsider the Lilies. I hope to finish it soon after some sad months. If it is finished I send you the pictures of i t.
A small milestone? You are much too humble. That is fantastic! And your work is beautiful, so I completely understand why they keep wanting MORE! I enjoy looking at your work. Congratulations! Oh how exciting for you, even if it won't be until next year. Congratulations! Those fans are just beautiful. Congratulations on reaching this amazing milestone Val. Hopefully you'll meet your other milestone of 600 followers soon. WOW Val that is a huge milestone! Congratulations, girl! I love all of your projects so much, you do exquisite work! I'm the same way, love to do embroidery at night, everything else during the day. Massive milestone, congratulations! And thank you for a lovely pictorial wander down memory lane, your work is so beautiful. Wow, that's amazing Mum! Great achievement... not so small! I have followed your blog anonymously for sometime; today I made it official. I love your fan work; they are quite gorgeous! Congratulations on this amazing milestone!! Your designs are lovely. I just printed out the most recent block to your free BOM. 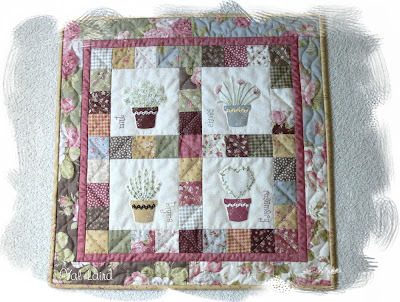 I plan to begin when I have all the blocks and just want to say THANK YOU for sharing!